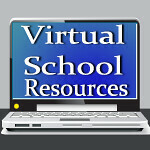 Virtual School Resources: Teach Literature Analysis the Fun & Easy Way! When our children begin middle school, they no longer want to do a lot of what has worked in the past for their schooling. Fun, one-page book reports are for the younger set. Now that they have learned to read well, time must be spent on analysis. What is the plot? Is there a conflict? These questions might typically make a middle schooler want to run and hide, but they can be explored with creativity with the Literature Analysis/Book Report Lapbook for grades 4-12 from Knowledge Box Central. Do your children love to read? Mine do! My 12-year-old daughter goes through books like there’s no tomorrow, but I sometimes worry that she misses a lot of what she’s reading as she doesn’t always take the time to pause & reflect. As she will be in 8th grade next year, book reports are B-O-R-I-N-G! Not so with this lapbook! These books make it easy for her to design a really cool project with all the elements of a book report, and more. I’ll also use the lapbook as part of my daughter’s art curriculum, as she'll add drawings throughout the project. My favorite aspect of this particular lapbook is the Alternate Endings page. Perhaps it’s because we are always talking about this in our reading, but it is so creative to try to think of other paths the book could have taken. The character died? What if he had lived? What if he had become President? What if you were his daughter?! Remember, this book can be used over and over, too. As your child gets older, there are projects that will challenge even high-schoolers. Creativity is key to keeping our kids interested in literature. If you need a little help getting those creative juices flowing, the Knowledge Box Central Literature Book Report Lapbook might be just the ticket. 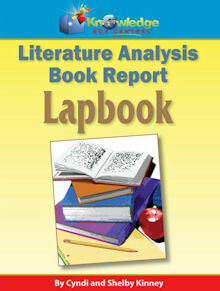 I'll be giving away ONE Knowledge Box Central Literature Analysis Lapbook to a lucky visitor later this week! Be sure to visit again so you can enter! Great review. We have this and use it with our 15, 12, 7, and 5 year old...the 3 year old likes to do his own version but isn't quite ready for his own yet. Thank you for your review. I just started homeschooling this year with my 7th grader. I've teamed with another Mom who has been homeschooling for 5 years now. I'm learning about lapbooks and I wondered it they were more for elementary level children, but my opinion is changing the more I research. I've recently discovered Knowledge Box Central and I have a growing list! Just this week I put together 3 folders as my first practice lapbook. I was amazed at how it works and folds up compactly for storage!